The BCTC Winchester-Clark County Campus is a 23,000-square-foot building on a 20-acre site located in the Winchester Industrial Park. The first building on campus was completed in May 2008. Most currently enrolled students are seeking academic credit through general education coursework. Our campus has continually provided workforce training for companies in Clark County and surrounding counties, including Advanced Green Components, Leggett & Platt, Osram Sylvania, Specialty Lighting, Peoples Exchange Bank, Winchester Municipal Utilities, Wintech Corporation and Sekisui. 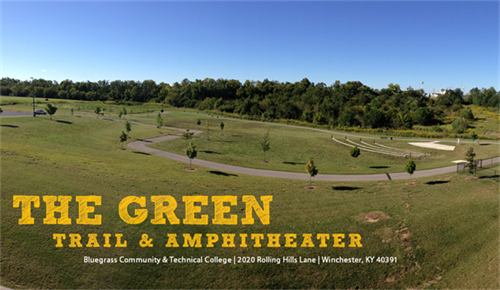 The Green, Trail and Amphitheater. Open from dawn to dusk. Bluegrass Children's Academy, full childcare located on site!